It has been Hot with a capital H for the past few days in Cape Town and surrounds. So hot in fact, that I have avoided my kitchen at all costs, preferring to eat cold fruit directly from the fridge, soak in cold baths and lounge in front of the fan. This morning we woke up to a slight reprieve from the heat. As someone so eloquently stated on Twitter: "Dear Cape Town...after much debate, Hell would like to thank you for returning its weather...have an awesome day now." Unfortunately my menu plan for the week did not take the weather into account and so I had a choice between Greek Green Bean Stew or homemade Turkish dumplings last night. *Note to self: check 7 day weather forecast when planning meals. * Needless to say the stew won. I just could not face folding little pieces of dough around mince last night. No sirree, not happening. Instead, I chopped up some aubergines, greenpepper, beans, tomatoes and onions, threw it in my wok with some olive oil and relaxed on the balcony with the wind (from the fan) in my hair and an ice cold G&T in my hand. Okay it wasn't a G&T, but soda with triple sec does not sound half as glamorous, does it? 1. Sprinkle aubergine with salt and leave to rest in a colander for about 30 minutes. Wipe dry and set aside. 2. Meanwhile, saute the onion, green pepper and garlic in a tablespoon of oil until soft, but not browned. Remove and set aside. 3. Add the remaining olive oil to the pan and saute the aubergines over medium heat until just cooked. 4. Add the beans, tomatoes and onion & greenpepper mix to the aubergines. Sprinkle with herbs, cinnamon and sugar and season with salt and pepper. Lower the heat, cover and let simmer until the beans are tender and the tomatoes have thickened into a sauce. 5. 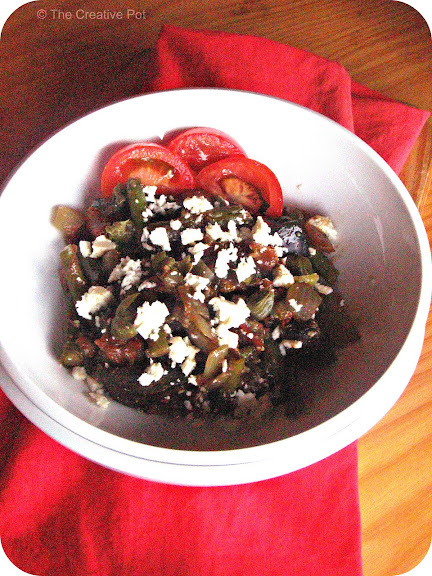 Serve while hot, scattered with feta and capers if using. ***PS: Excuse the crappy picture quality - I blame it on bad lighting. Dear Cape Town...after much debate, Hell would like to thank you for returning its weather...have an awesome day now. - What a classic, and so true!!! I also can't face my kitchen or my stove, I think my stove thinks I have gone on holiday! Love dish, very brave in yesterday's heat! Cinnamon in stew? Check. I'll be making this.